Fear. Even the most experienced, educated of us can be bowled-over by a child's frightened, fear-filled feelings. How to cope and learn how to deal with these normal, human feelings? Read Sink or Swim by Patricia Merker and follow-up with the fun and poignant activities suggested on the Grand Master/Little Master section of [...]. Every professional or parent working and playing with youth can use a refreshing way to address life's challenges. The sweet, clear GM/LM book series is a new way to bring-up -- in story conversation -- such vital and sometimes deeply moving life issues as fear while giving ways to teach how to live well through them with life-lasting skill. 3) The touch of mystery to this story about fearful things is Haley's inner knowing, the sense of what is kind and loving for the good of all, including what is surprisingly good for herself! I will be giving a full review of this title on my blog in a few weeks or so and will then place the review here. Great stories for kids to read and parents too. David and I have five children and I can tell you it is a zoo at our home most days. Everyone has their own agenda including the two of us and wow life is crazy. Teaching values and how to be a good person is a full-time job and yet sometimes it gets lost with all the other things the kids need to learn and do. This series is a nice remi I will be giving a full review of this title on my blog in a few weeks or so and will then place the review here. Great stories for kids to read and parents too. Awesome book to help adults realize how fear can paralyze kids and what we can do to help them get thru it. So often as parents we try to use adult solutions for kids problems, and the kids just don't relate to things the way adults do. I love these books. The lessons are so heart warming, and you just want to hug the characters in her books. Talk about great for a kids self esteem which is so important in this day and age. 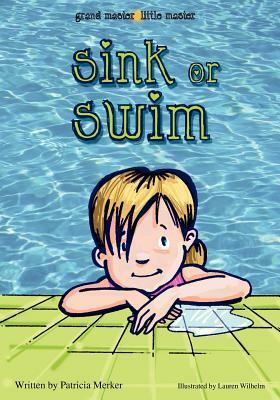 I give Sink or Swim by Patricia Merker 5 stars. Delightful! I'm sure my great-grandkids will benefit from the inspiring message this book brings. Congratulations Ms. Merker!